Green Mountain Coffee Roasters started as a small retail coffee shop in 1980. 30 years later the corporation is acquiring other coffee companies and watching its stock price rise dramatically. We learn what’s driving that growth, and how Green Mountain Coffee Roasters fits into the national marketplace of specialty coffee while maintaining its Vermont roots and social responsibility mission. Also in the program, an update on the criminal trial of Michael Jacques, the Randolph man accused of sexually assaulting and murdering his 12-year-old niece. Rulings by District Court Judge William Sessions last week have implications for jury selection and whether federal prosecutors may seek the death penalty. Reporter Andy Bromage of Seven Days explains the rulings and the next steps in the case. Green Mountain Coffee Roasters shares gained ground late Tuesday and into Wednesday on the heels of a fiscal fourth quarter performance that far exceeded expectations. 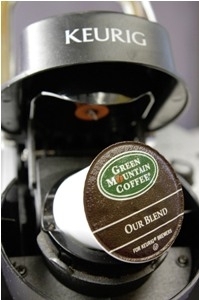 Green Mountain Coffee Roasters says it’s hired an executive from Coca-Cola as its new CEO.